ELIZABLAZE | Discover Purpose. Live on Purpose. 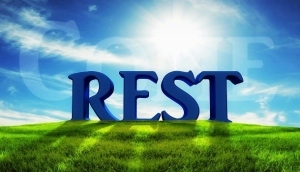 Live Creatively: Sabbath's Appetizer- Enter into his rest. Sabbath's Appetizer- Enter into his rest. Recently I was in a chemist while someone's blood pressure was been checked so I asked to check mine. After the nurse who owned the place was done she told me my result. Smiled and said I don't have anything I'm thinking (worried) about so it has to be normal. In my mind I was said, "because my BP is normal means I don't have thoughts? But if it had been high and she's dishing out drugs for me then she would know I have thoughts?"... Hmm, what a life. I remembered a little girl of about 2+yrs that rested her chin on her palm in such a funny way that someone was forced to ask the mother what the girl was thinking. The mother replied that her daughter doesn't have any thought and told the person that asked the question to stop the joke... Now, that little girl is the type of person you say has no thought! I'm sure if I'm to tell the Nurse my thoughts she would run...LOL. But on a serious note, I have things that get me worried but I don't carry the worries on my head. I've learnt to trust God and cast my worries at his feet. Worry and put myself at the mercy of mortal humans? No please. Five, ten years ago I'm sure I had things that got me worried and I can't even remember them anymore. It shows that whatever thing I'm confronted with now will also pass, that I'm confidence about.